Hey guys! Laura here. Guess what? On Wednesday, September 22, my job let me go for the third time in five years. It was an abrupt layoff - you know, the kind where you flip out, throw your keys at your boss, and walk out the door. Yep, it was quite the scene. In the middle of my meltdown, after gathering my things in preparation to storm out the door, I remembered that I had a Healthy Choice frozen meal in the office fridge. Not wanting to leave my lobster cheese ravioli to the remaining cubicle dwellers, I stopped mid-rant, walked to the kitchen, and retrieved my meal. As I pulled out of the parking lot for the last time, I glanced over at my box of ravioli and was glad to have rescued it from that rotten place. The moral of this sob story is that no one gets between me and my Healthy Choice meals - not even a layoff, concerned co-workers, or that sneaky office thief who used to steal people's lunches right out of the refrigerator (I know who you are ... I think). I've been eating Healthy Choice meals for quite some time. I even did a review of one back in May of 2009 (click here to read it). The reason I keep coming back to these meals is because they are inexpensive, very easy to take to the office, and are always fresh and tasty. THE VERDICT: Awesome! 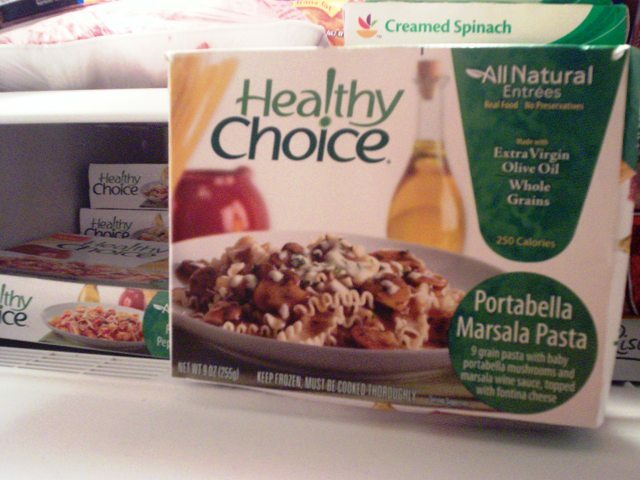 Healthy Choice has never let me down, and if they have, I've obviously forgotten all about it. Some of my favorite meals are the pumpkin squash ravioli, the portabella marsala pasta, the Asian potstickers, and the pineapple chicken. I was lucky enough to receive some fantastic coupons from the main office, but even without the coupons, these meals would have definitely made their way into my shopping cart. The vegetables are always fresh and crunchy, the meat is always tender and never chewy or fatty, and the sauces they use are insanely flavorful. The Healthy Choice options are probably your best bet when you want to grab a quick, healthy meal. They have so many options now (Steaming Entrees, Fresh Mixers, Complete Meals, Cafe Steamers, etc.) that you really can't go wrong. If you haven't tried one yet, make sure you do. It won't cost you much and you will be pleasantly surprised that a frozen meal can actually taste good. I can't wait to bring them to my new job ... whenever I get one. Is anyone hiring?